The Parallax's classic propeller programmer PropPlug is simply a USB to Serial converter, the DTR/RTS signals are used to reset the Propeller chip before starting the programming sequence. "USBThumb Propeller Programmer" available on GadgetGangster.com, it allows you to use USBThumb as a Propeller Programmer but also as USB to Serial converter. USBThumb (loaded with USBThumbSerial firmware) is detected on your computer as a standard CDC Modem device and works on all modern operating systems (Windows, Mac os , Linux). On Mac OS, once you attach the device you will get a prompt "A new network interface has been detected". Look in the /dev folder. You should see it as "/dev/tty.usbmodem411" or similar. PropellerTool can scan all available ports and find the one that has a propeller chip attached. So the above step might not be necessary, however if you already know the COM port of USBThumb you can specify it explicitly. 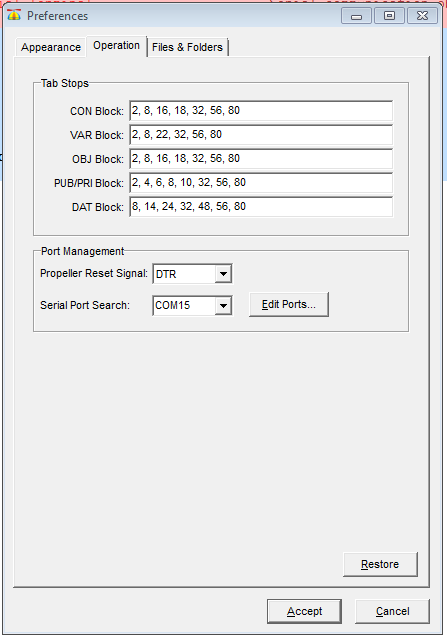 In the PropellerTool go to Edit > Preferences>Operation and update the "Serial Port Search" to the port number of USBThumb (COM15 in my example). In the "Propeller Reset Signal" choose DTR. Next attach the USBThumb to your Propeller development board, USBThumb's serial 4-pin connector is pin compatible with PropPlug. The pins are marked as follows RX,TX,RST,GND. To test the communication with the propeller board press F7. 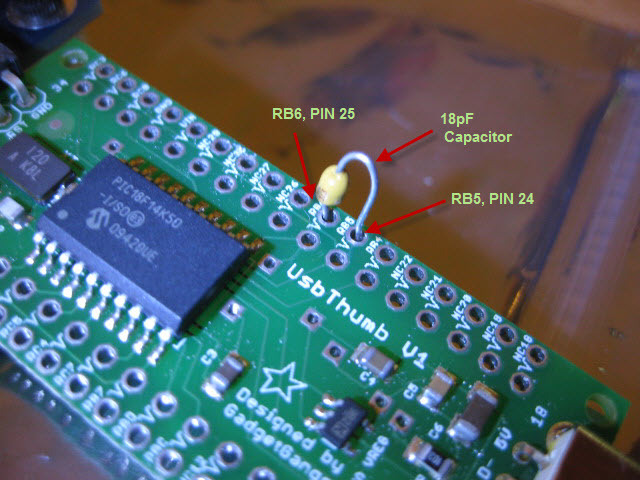 You can solder the capacitor permanently between these pins, or if you're planning to use USBThumb for other projects and you have soldered sockets to the board simply insert the capacitor in the socket between pins 24 and 25. You only need to take this step if you have intermittent problems with PropellerTool not detecting the Propeller chip. 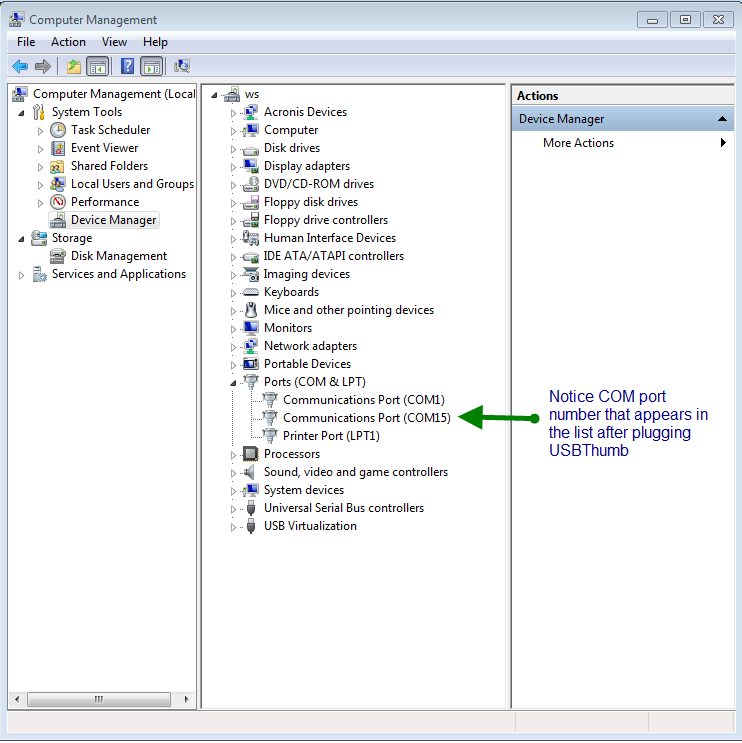 A small correction, It needs to say CDC modem, not HID CDC, those use different drivers. CDC always requires a custom inf, and HID does not.